Christopher Marlowe’s play EDWARD II written in the 16th Century about the medieval King who was deposed and beheaded is too rarely performed. 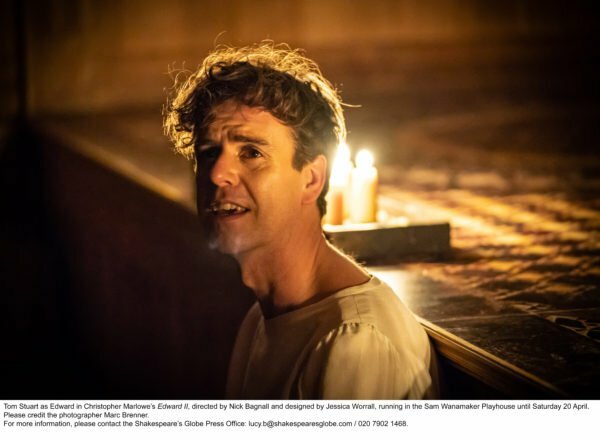 Which makes this new production at The Globe’s Sam Wanamaker Playhouse in London even more special, particularly as for once the talented lead actor TOM STUART playing the role the gay King is also openly gay. The play that has just opened to excellent reviews will be followed by second play performed by the same cast and written by Stuart himself and called After Edward. In a Facetime interview with Queerguru, the disarmingly charming Stuart talked about both the significant importance of Marlowe’s play to our community, and that his own play is based on how he reacted to playing such an intensely complicated figure such as Richard who was persecuted mainly for his sexuality. P.S. You can read Queerguru’s Jonathan Kemp’s ☆☆☆☆☆ of Edward II here, and look out for our review of After Edward when it opens in London.